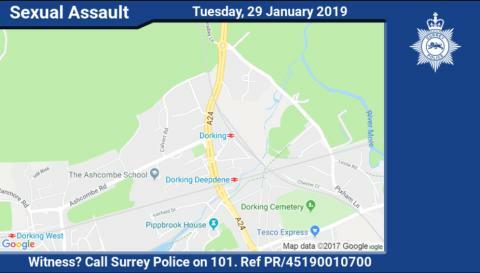 We’re appealing for information after a 12-year-old girl was sexually assaulted near Dorking train station on Tuesday (29 January). The girl was walking alone alongside the Pixholme Grove Allotments at around 4pm when she was approached by a teenage boy. He blocked her path and then touched her inappropriately. He then ran off along the footpath in the direction of the train station and town centre. He’s been described as white, believed to be 15 or 16-years-old, medium build, with very short black hair and brown eyes, freckles on his face, and no facial hair. He’s thought to be approximately 5 ft. 7 tall and speaks with a London accent. Detective Constable Christine Turton said “This was a distressing assault on a young girl and we’re providing her with the support she needs. If you have any information or you were in the area at the time, contact Surrey Police on 101 (999 in an emergency) or http://surrey.police.uk/TellUsMore , quoting reference PR/45190010700.